The Kenyan government is planning to have new diplomatic missions in at least six African countries, Somaliland among others, hereby showing its growing interest in intra-African trade. Kenya is planning to open embassies in at least six Africa countries in an effort to deepen economic diplomacy on continent. Foreign Affairs Permanent Secretary Thuita Mwangi on Wednesday [24 October 2012] told the Nation that the government was planning new diplomatic missions in Ghana, Algeria, Morocco and Angola. An embassy in Senegal will serve as a key entry point for Kenyan commerce into Francophone West Africa while a mission will also be established specifically for the eastern region of the Democratic Republic of Congo (DRC). 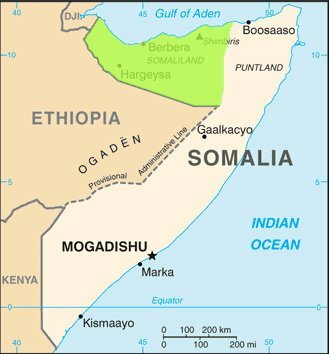 At the same time, the Kenyan embassy to Somalia, currently based in Nairobi, will be moved to Mogadishu while a separate mission will be sent to Hergeisa in Somaliland. “Africa is becoming more and more competitive. We realise the importance of intra-African trade. These missions are one way for us to pursue our economic interests on the continent,” said Mr Mwangi. He was speaking during a breakfast meeting to address private sector concerns over regional trade barriers. According to the World Bank, Africa loses billions of dollars annually due to intra-regional trade barriers. Intra-African trade, which accounts for about 12 per cent of the continent’s total trade, could become more essential as an economic crisis ravages traditional markets in Europe. In the West African powerhouse Nigeria, Kenya has already established one of the largest embassies on the continent. The ministry is hoping that the country will prove a ready market for dairy products, tea and cut flowers from Kenya. Mr Mwangi also revealed that a treaty with Ethiopia that would allow Kenyan traders free movement in the country was nearing conclusion. Kenya has been actively seeking markets in non-traditional trading partners as the credit crunch continues to constrain Western Europe’s purchasing power. The country is also trying to extend its influence in Africa in the face of stiff competition from South Africa and Nigeria. Last month, Kenya took a delegation of representatives from the energy and agricultural sectors to Russia to explore investment partnerships. Earlier this month, the ministry of Foreign Affairs was selling the country to investors in Kazakhstan. To tighten its grip on the East African region, the country is establishing a regional integration technical fund that is expected to provide training and education to students from the region, thereby advancing Kenya’s soft power. As a bulwark to all these plans, Kenyan embassies abroad are facing an overhaul that will see an increased focus on the economy as opposed to politics and culture. Currently, the ministry is training foreign service appointees in business and economics. “We need to rationalise and make our embassies more effective, efficient but lean. We want to break away from the past and structure our embassies in such a way that they become a sales force for our businesses,” said the permanent secretary.